Sri Lanka took a policy decision to integrate leprosy services into the general health services (GHS) in 1999. This paper aims to summarize the emergence of new, specific challenges and how they were overcome during the integration of leprosy services to the GHS in a remote, leprosy endemic district in Sri Lanka. In this article, the regional epidemiologist as the team leader describes the principles used for transition to an effective integrated model of leprosy services from a centralized leprosy control model in the district. In addition, rationale for integration is viewed from the epidemiological and operational perspectives. National and district leprosy epidemiological data from secondary sources are also reviewed for corroborating the effectiveness of integration. Challenges surfaced were mainly related to the transfer of ownership of the programme, selection of appropriate service providing institutions easily accessible to clients, sustainability of leprosy services at the GHS, ensuring participation of all stakeholders in capacity building programmes and co-ordination of patient care in the absence of a dermatologist in the district. An empowered district team leader with specified roles and responsibilities, his sound technical and managerial know how and ability to translate 'team work' concept to practice were found to be essential for successful implementation of integration. Decision-making powers at the district level and flexibility to introduce new, area-specific changes to the centrally prepared core activities of integration were also vital to overcome locally surfaced challenges. Several countries have translated integration into a reality. , Transition from a specialized campaign to an integrated service is complex. Although problems arose due to inadequate planning in some countries, , good preparation and meticulous planning addressed specific challenges in Sri Lanka. However, due to varying operational and logistic issues, some unanticipated, local challenges emerged in different districts. We describe how we overcame these challenges in Polonnaruwa district during integration. Meanwhile, a deformity rate of about 10% among new cases reflected inadequate diagnostic services and misdiagnosis of leprosy. , Given poor geographical and temporal access of only 225 clinics to patients, expansion of services was vital to eliminate leprosy in remaining districts. 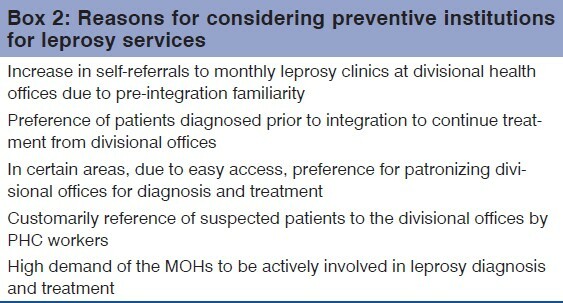 Integration of leprosy services in Sri Lanka focused on key objectives  given in [Box 1] [Additional file 1]. The District Leprosy Elimination Programme was exclusively carried out by one well-trained and experienced Public Health Inspector. Self-referrals and patients directed by the curative network were followed up by the Public Health Inspector in field clinics. Complicated cases were referred to the anti-leprosy campaign for specialized management. Patient records were also maintained by the Public Health Inspector. Sustaining a harmonious relationship with the previous owner was the biggest challenge for the new team leader. Conceptually, replacement of a veteran by a novice naturally leads to dependence of novice on the veteran without realizing that leadership belongs to the novice. Such dependence tends to confuse health workers in the GHS as to which line of authority to follow, particularly in our case, given the strong image of the previous owner related to leprosy. Therefore, effectively utilizing and sustaining his services in the new role, self-perceived as 'demoted' in the post-integration period was daunting. Having foreseen this issue, an Individual Treatment Card posted to the campaign soon after filling the last dose of multi-drugs was designed to update treatment completion status. Nevertheless, only 60% of cards were received by the campaign  resulting in inability of the district to receive information on treatment completion. In pre-integration, data for local analysis was available in patient registers at divisional levels. However, this was impractical in the post-integration without a proper mechanism of flow of patient information to the divisional level. Having emphasized the importance of availability of data at the divisional level, we designed an alternative data flow from the district to the divisional level. An additional monthly return to each division with details of newly detected patients, date of their first treatment and details of subsequent multi-drug doses of previous patients was designed. Using this return, divisions were able to complete their data bases. However, we encountered a divisional level indifference to managing information due to the negative influence of the pre-integration system where divisional statistics were maintained by the Public Health Inspector. Outcome could have been bouncing back of information management to the vertical staff. We avoided this by training newly designated 'Programme Planning Officers' to manage leprosy information at the divisional level. Capacity building at district/sub-district levels was the key in transition from vertical to an integrated programme. Although re-orientation of medical officers was a challenge for the centre  with a national figure of only 85% of re-oriented provincial doctors,  in our district, their response to re-orientation was overwhelming. In all institutions, team leader identified absentees and special individual or group re-orientation sessions on symptoms, diagnosis, management and rehabilitation of leprosy patients were held for them. This strategy enabled re-orientating all medical officers in GHS in the district as opposed to 85% of provincial and 60% of central ministry hospital doctors trained nationally. Additionally, PHC workers were re-oriented for detecting suspected leprosy cases in community, referring to GHS, de-stigmatization, counselling and community involvement. Leprosy services are more accessible and effective when provided closer to community. In Sri Lanka, traditional medical care, sought by many with symptoms such as numbness, joint pain, paralysis, etc., is crucial for service provision closer to community. Inadequate knowledge of traditional practitioners on leprosy was a reason for high deformity rates in Sri Lanka despite low prevalence of leprosy. , Therefore, re-orientation programmes were extended to all traditional practitioners to dispel myths and familiarize them with signs and symptoms of leprosy. Although the task was challenging, their participation rate and enthusiasm was remarkably high. Although ensuring availability of diagnostic and treatment services at all curative institutions  was a key national objective, due to some district-specific characteristics indicated in [Box 2] [Additional file 2], we faced a dilemma as to whether we should deviate from this national policy. Considering relevance of these reasons for easily accessible services, district authorities allowed preventive institutions to continue leprosy services. Brazil  and Myanmar  similarly have effectively used family health teams to provide leprosy care in the post-integration. Although integration does not exclude specialized elements,  interestingly, absence of a dermatologist in the district had overall positive effects on integration. Low interest in leprosy by medical officers due to increasing specialist dermatologists was reported as a reason for their low attendance for re-orientation programmes in large hospitals during integration. Despite more than 60% of leprosy patients in Sri Lanka  and 80%  in China being detected in institutions with a dermatologist in the post-integration period, in Polonnaruwa, the majority of new patients was detected by non-specialists at all levels. One lesson to be learnt from our experience is the possibility of unfolding different local challenges during actual implementation notwithstanding meticulous national planning and preparation preceding it. Change is always fraught with difficulties but proper management strategies help overcome these. We elaborate that commitment and innovation by district managers are vital for success and lack of which has the potential for failures of the programme as demonstrated in Jigawa state in Nigeria  and in Tamil Nadu. Based on our experience, we highlight the indispensable nature of having an empowered, district team leader with specified roles and responsibilities to address these issues successfully and sustain services. For the future benefits of programmes, it is worth mentioning that sound technical and managerial know-how and commitment of the team leader are essential in solving multi-faceted challenges. Such district health managers empowered to effectively monitor integration and correct operational problems early have also been reported from Ghana. However, we accentuate the challenging role of the manager in the presence of the previous owner. We opine that efforts such as accepting the previous owner in the team to compensate his perceived loss of status, spelling clear roles for him, practicing team work concept and creating a favourable environment for operation used to off-set challenges in our district will be useful in similar future exercises. Implementation of integration varies within and between countries. In this context, we learned that peripheral decision-making power and flexibility in introducing new area specific activities to core activities in central plans were essential to better address local issues. This context specific integration  may prove to be handy for programme managers in different settings. Easy access to multi-drugs is an advantage of integrated services. Visschedijk et al., opined that accessibility and quality of leprosy services depend on the health system through which they are implemented. Therefore, demonstrating the district decision allowing preventive institutions also to provide these services, we highlight the importance of identifying the most appropriate institutions to provide diagnosis and treatment based on easy access, client's acceptability and service providers' willingness. In this exercise, we also learned that re-orientation should focus not only on knowledge enhancement but also positive attitudes of staff towards the service and patients. It required multiple methods of capacity-building and motivation for new roles without additional benefits. At times, extreme measures such as 'One to one' encounters with individuals reacting negatively to integration were effective. In post-integration, prevalence (0.9-1.5/10 000 population) and New Case Detection Rate (NCDR) (1.6-2.1/10 000 population) increased relative to 1998 (prevalence-0.7/10 000 population, NCDR-1/10 000 population). Detection of relatively higher grade II deformity rates (12.2-16.1%) in post-integration indicated capturing of patients previously undetected by the vertical programme. Diagnosis and treatment of leprosy patients at all levels of institutions indicated competence of medical officers and access wise, it reflected provision of leprosy services closer to the community. This was consistent with the national trend of more patients being detected by non-specialized institutions in remote districts without dermatologists. As suggested by Feenstra,  these reflect the success of integration. Based on this experience, we recommended that decision-making powers and flexibility vested upon district managers to introduce area-specific changes to centrally planned core activities be continued for effective context specific solutions to future challenges. 1. Feenstra P. Leprosy control through general health services and/or combined programmes. Lepr Rev 1993;64:89-96. 2. Visschedijk J, Engelhard A, Lever P, Grossi MA, Feenstra P. Leprosy control strategies and integration: An international perspective. Cad Saúde Pública 2003;19:1567-81. 3. McDougall AC. 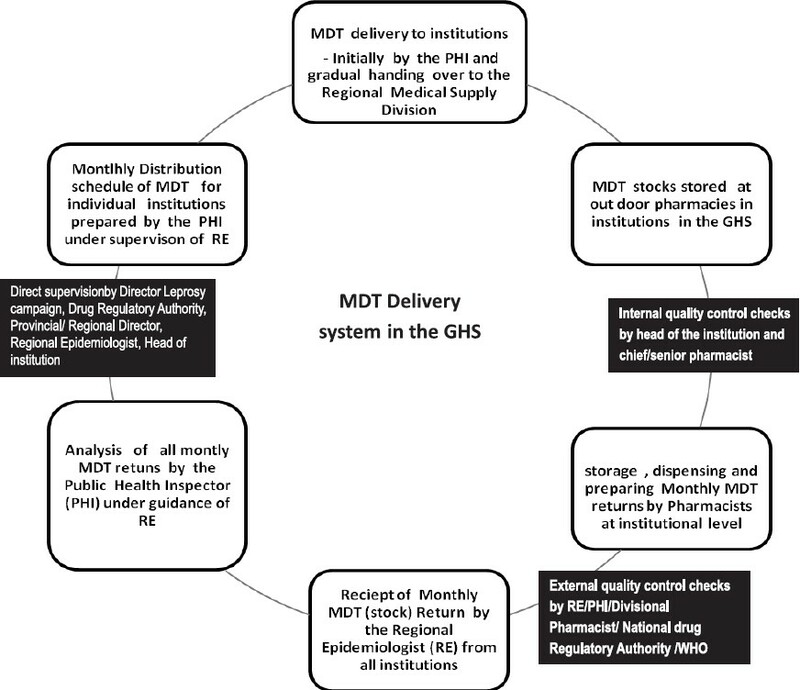 Leprosy Control and the implementation of multi drug therapy: To what extent can the operational strategy be simplified for primary health care? Lepr Rev 1992;63:193-8. 4. Seventh Report of World Health Organization Expert Committee on Leprosy: WHO Technical Report Series 874. Geneva; World Health Organization; 1998. 5. The Final Push Strategy to Eliminate Leprosy as a Public Health Problem: Questions and Answers. Geneva; World Health Organization; 2003. 6. Feenstra P, Visschedijk J. Leprosy control through general health services: Revisiting the concept of integration. Lepr Rev 2002;73:111-22. 7. International Federation of Anti-Leprosy Associations (ILEP). ILEP technical guide facilitating the integration process: IA Guide to the Integration of Leprosy Services within the General Health System. London: ILEP; 2003. 8. Kasturiaratchi ND, Settinayake S, Grewal P. Processes and challenges: How the Sri Lankan health system managed the integration of leprosy services. Lepr Rev 2002;73:177-85. 9. Rao PS, Gift N, Rao GS, Samuel P, Bushanam RS. Elimination of leprosy: The integration of leprosy related activities into the general health services of Tamil Nadu. Lepr Rev 2002;73:123-9. 10. Namadi A, Visschedijk J, Samson K. The leprosy elimination campaign in Jigawa, Nigeria: An opportunity for integration. Lepr Rev 2002;73:138-46. 11. Settinayake WA, Herath HM. Leprosy Control in Sri Lanka. Public Health development in Sri Lanka: Millennium supplement; 2001. p. 63-6. 12. Report of the inter country meeting of the National Programme Managers of Leprosy Elimination at Kathmandu, Nepal on 6-8 January. New Delhi: WHO Regional Office for South East Asia; 2005. 13. Kasturiaratchi ND, Grewal P, Gunawardane P. Epidemiological and socio-cultural impact of Social Marketing programme for Leprosy Control in Sri Lanka. Proceedings of the 15 th International Leprosy Congress. 7-12 September, Beijing, China; 1998. 14. Kasturiaratchi N, Grewal P, Weiss M. Working with non bio medical health care providers for leprosy elimination. Proceedings of the 15 th International Congress, 7-12 September, Beijing, China; 1998. 15. Blueprint for integration of leprosy into the General Health Services: Ministry of Health, Sri Lanka in association with the Novartis Foundation for Sustainable Development, Basle, Switzerland. Colombo: Anti Leprosy Campaign; 2000. 16. Astoria H. Teamwork: A new twist to old Asian collectivism. Available from: http://www.leader-values.com/Content/detail.asp? ContentDetailID=260 [Last accessed on 2012 Aug 17]. 17. Integration of leprosy services to general health services: General circular No: 2-157/2000. Colombo: Ministry of Health; 2000. 18. Bainson KA. Integrating leprosy control into primary health care: The experience in Ghana. Lepr Rev 1994;65:376-84. 19. Ariff MA. 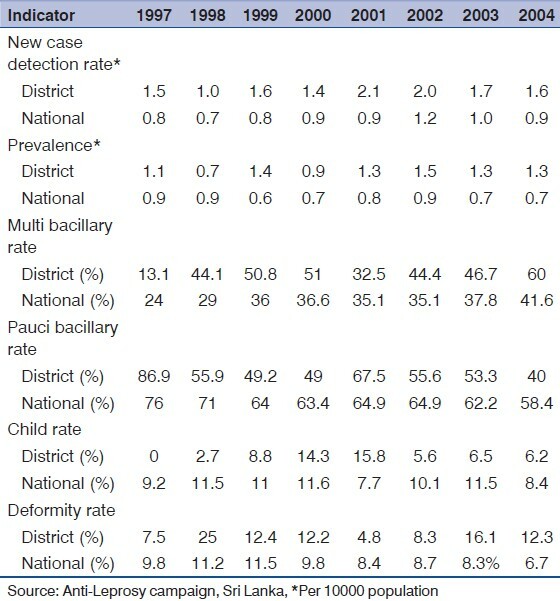 Availability of records and reports in health facilities in India under integrated leprosy services of India. Lepr Rev 2005;76:348-51. 20. Pandey A, Patel R, Uddin MJ. Leprosy control activities in India: Integration into General Health Services. Lepr Rev 2006;77:210-8. 21. Hutton G. Issues in integration of vertical health programmes into sector wide programmes: Introductory text for discussion group. Available from: http://www.dgroups.org/groups/sdc-health swaps/docs/Introductory%20Text%20Guy%20Hutton%2018%20June%202002.doc?ois=no [Last accessed on 2012 Aug 17]. 22. Report of an assessment. Colombo: Anti Leprosy Campaign; 2008. 23. Barua S, Wakai S, Shwe T, Umenai T. Leprosy elimination through integrated basic health services in Myanmar: Role of midwives. Lepr Rev 1999;70:174-9. 24. Wijesinghe PR, Settinayake S. An analysis of the pattern of detection of leprosy patients by the General Health Services (GHS) in Sri Lanka after the integration of leprosy services into general health services. Lepr Rev 2005;76:296-304. 25. Chen S, Han C, Li B, Zheng R, Zhang L. A survey on skill and knowledge in early diagnosis of leprosy in GHS at different levels in Shandong province, the People′s Republic of China. Lepr Rev 2000;71:57-61. 26. Roos B, Van Brakel WH, Chaurasia AK. Integration of leprosy services into basic health services: An example from Nepal. Int J Lepr Other Mycobact Dis 1995;63:422-9. 27. Asnake MK, Ahmed M, Genebo T, Dawit MW, Mekebib B. Knowledge and attitude of health professionals in relation to integration of leprosy control in the general health services in Ethiopia. Int J Lepr Other Mycobact Dis 2000;68:299-306.